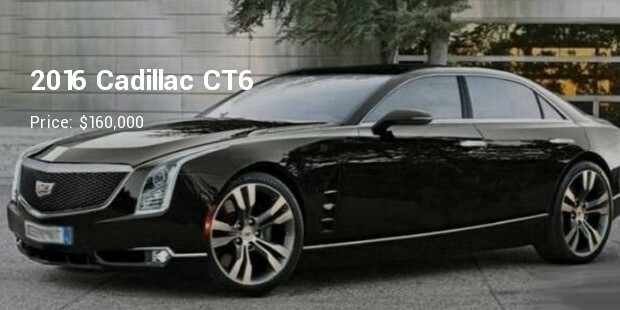 Cadillac motor car division is a high-end product of US based General Motors that makes luxury vehicles globally. Cadillac automobiles have been retaining the top spot in terms of providing comfort in the US since its inception. During 2012, the sales of Cadillac were 149782 vehicles. It is one of the oldest car brands in the world. In 1909 General Motors bought the company and Cadillac established itself as one of the finest and luxurious car makers of America. It was at the fore front of technological advances with introducing full electrical systems, steel roof and the clash less Manuel transmission. 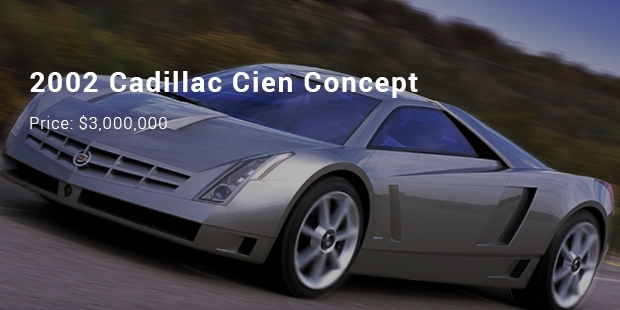 The Cadillac Cien is developed by Cadillac and revealed at the Detroit Auto Show in 2002 to celebrate the Cadillac’s 100th anniversary. This car is a two-door rear mid engine and rear wheel drive layout high speed car. It has a 7.5 liter V12 engine, which produces 950 bhp and 750 lb-ft and can reach a maximum speed of 350 km/hr while attaining 0-100 km/hr in 3.5 seconds. 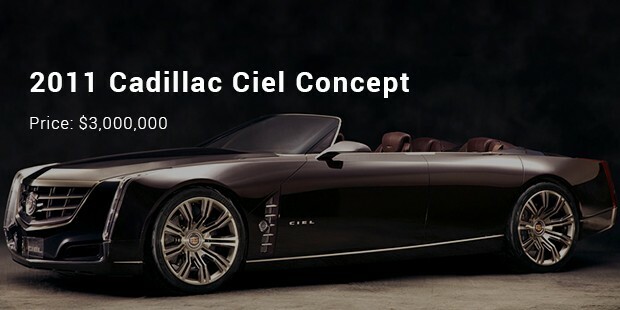 The Cadillac Ciel was revealed in the Pebble Beach Concourse D’elegance in 2011. This car is a hybrid electric concept car made by Cadillac. It has a twin turbocharged 3.6 liter V6 engine producing 425 bhp with an inbuilt lithium ion battery technology. In 5 seconds this car can attain a speed of 0-100 km/hr. 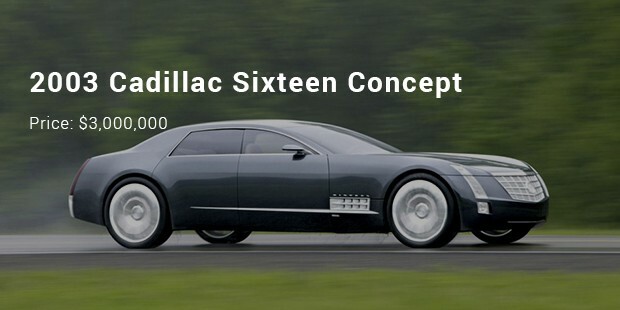 In 2003, Cadillac produced its first high pickup Cadillac sixteen concept car. It features a 32 valve V16 engine replacing 13.6 liters which was initially restricted to the sixteen models only. The engine has a fuel saving active fuel management dislocation and produces a minimum of 1000 bhp and at least 1000 lb-ft torque. 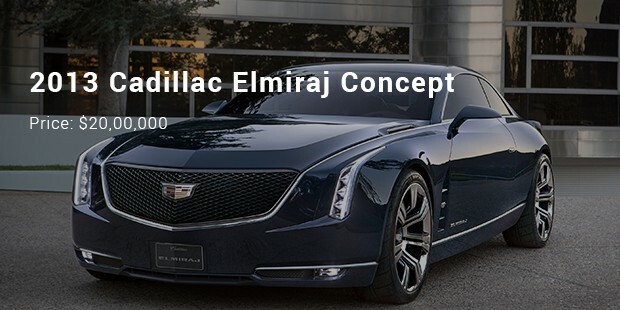 The Cadillac Elmiraj Concept was made public during 2013 Pebble Beach Concourse D’elegance. This rear wheels driven four seated coupe has a two-door concept. It features a 4.5 liter twin turbocharged V8 engine producing an estimated 500 bhp. 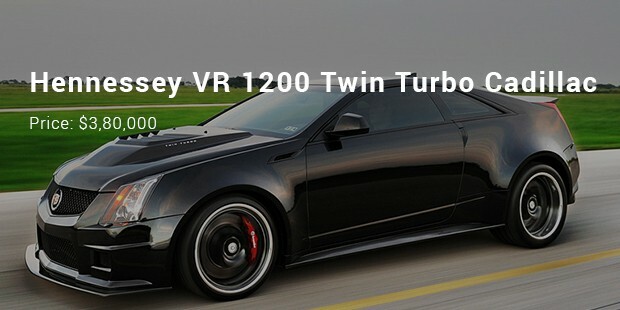 Hennessey is known for making super cars & this time it has converted the Cadillac into a VR 1200 Twin Turbo Coupe. It appears like a monster, with some great features & awesome performances. Powerful engine of 1226 bhp at 6400 rpm with a 427 CID Aluminium V8 engine having Brembo brake system. It has Hennessey wheels & Michelin Pilot super tyres. With premium embroider headrest & floor mats, the leather interiors look simply superb. 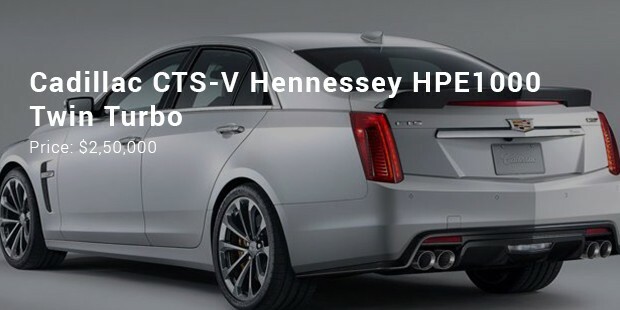 Another masterpiece from Hennessey for Cadillac. This car tops the speed of 337 kmph, with an engine power of 800bhp. The highly stressed engine doesn’t cannibalizes its valves, rings and seals. It has Brembo two pieces front brake & the interiors being classy and chick. 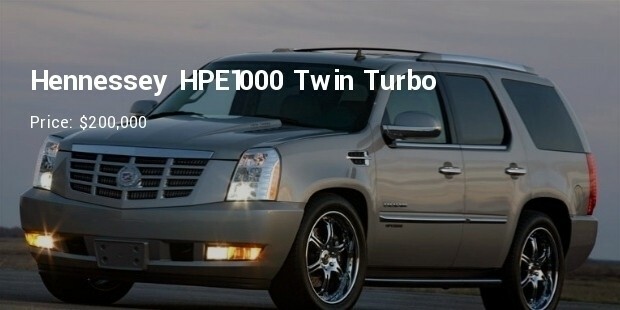 The HPE1000 gets power from twin turbochargers, which are installed in place of the factory supercharger. The engine gets upgrades to handle the boost, including forged pistons, rods and crankshaft, a custom cam, ported cylinder heads, fuel system upgrades, an electronic boost controller, an air-to-air intercooler, a stainless steel exhaust and HPE engine calibration. 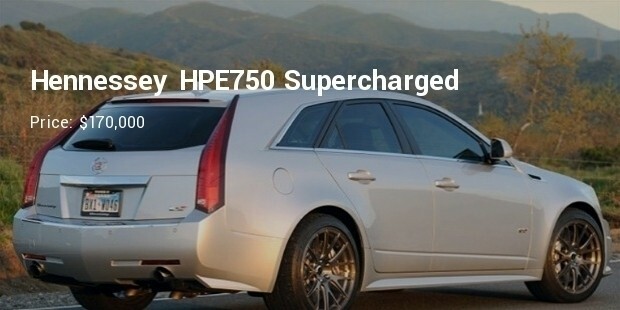 The HPE1000 comes with a one-year/12,000-mile warranty. 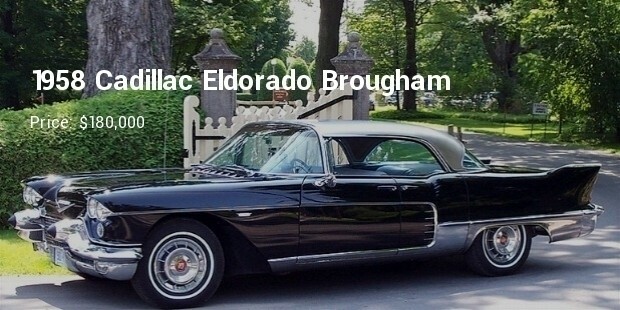 Available in Biarritz convertible and Seville hardtop form, along with the hand-built Brougham four-door hardtop, the Eldorado was Cadillac’s undisputed image leader for 1959. 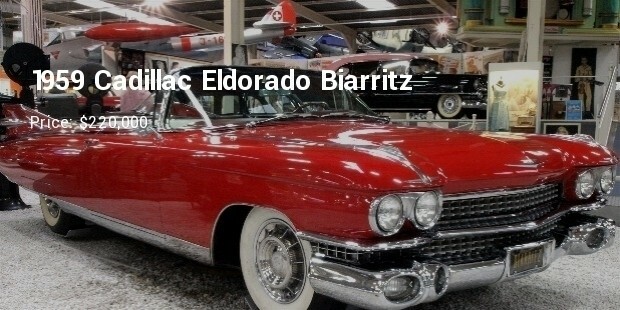 Standard Eldorado equipment included a heater, fog lamps, air-assisted suspension, a radio with a rear speaker, power windows, a six-way power front seat, power door locks and whitewall tyres. This Caddy is outfitted with the HPE1000 twin-turbo package, Hennessey's top of the line performance kit for the Escalade. It attains a top speed of 290 kmph and has a power of 1015bhp, weighs almost 2650 Kg. A vintage car which has been restored with great investment is a class of its own. The 1958 Cadillac Eldorado Brougham is finished in Black with a Black and White leather interior. The restoration of the car encompassed a complete disassembling of all body and interior components. 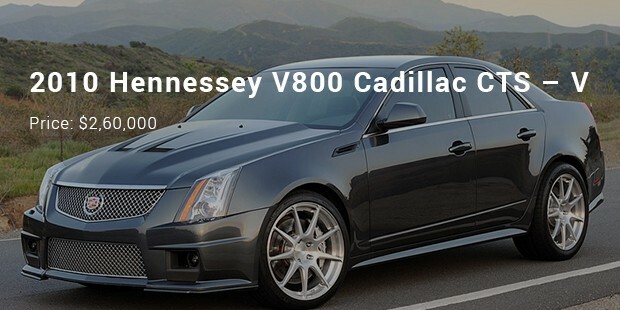 Hennessey Performance has a long history of taking already fast cars and pushing them to the limit. This model attains a speed of 315 kmph, having an engine power of 759 bhp, weighing around 1980 kgs. It comes with Hennessey trademarked interiors of superior quality. This CT6 version is remarkably lightweight. It rides on an extremely stiff chassis, utilizing a mixture of steel and aluminium. It also uses fewer parts in critical areas to keep weight low and increase stiffness compared to an all-aluminium chassis. The use of steel in key areas not only increases strength but also reduces the need for heavy sound-deadening material because steel provides better acoustic “sealing” compared to aluminium..
Cadillac is the most famous among all the car brands putting its mark since its birth. It has its roots strongly spread in the automobile industry and is the oldest company serving the world with its luxurious and innovative sedans!